Fans of the TV series Countryfile now have the opportunity to visit the home of its presenter, Adam Henson, more easily as regional coach operators Bakers Dolphin, are offering tours to the well-loved farm park. As subject and setting of one of Countryfile’s regular features, Adam’s Farm has never been more popular with fans of the show. 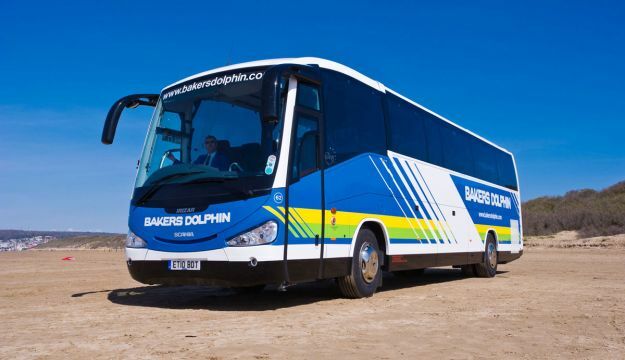 West Country coach travel experts Bakers Dolphin have now added the attraction to their schedule of day trips and say it is proving popular with local families. Amanda Harrington, Sales and Marketing Director at Bakers Dolphin said: “The farm holds something of interest for everyone, whether it is a farm safari ride, a wildlife walk, or simply a visit to the café. Opened in 1971 to preserve rare breed farm animals and to educate the public about them, Adam’s Farm has since drawn in millions of tourists. Daily demonstrations, an adventure playground, a tractor school and other popular facilities have made the farm a favourite for all visitors. Henson’s regular reports on the practical challenges that he faces have made the farm an unmissable attraction for any viewer of Countryfile. Bakers Dolphin coaches are leaving from various locations in the South West for the tour on 27 September and 18 October.Bookings can be made online at www.bakersdolphin.com or by telephone on 01934 415000. Adam’s Farm is a popular attraction for prebooked group visitors, offering all ages, from WI’s to social and holiday clubs, a memorable visit. Your group will be greeted by a friendly member of staff on arrival who will talk them through the facilities and activities available. You may like to book an introductory talk for your group or maybe a tour around the Rare Breeds in History trail. Team members are friendly and knowledgeable and refreshments are available. A range of hot and cold food is available in Adam’s Kitchen and there is a gift shop to browse around.Group discounts, free coach parking and coach driver hospitality is available.